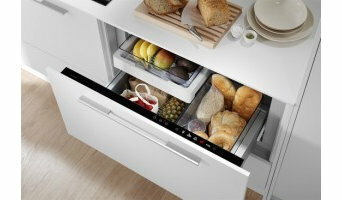 Fisher & Paykel have been designing products since 1934 and have grown into a global company operating in 50 countries. Our design heritage is founded on a pioneering spirit and a culture of curiosity that has challenged conventional appliance design to consistently deliver products tailored to human needs. For us, legacy is about looking to the future while ensuring what we develop today is aligned to the fundamental principles of sustainable design. 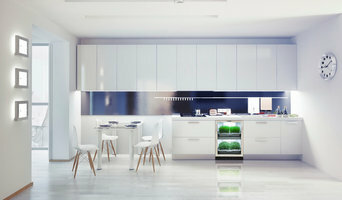 The Fisher & Paykel brand incorporates the world’s most innovative technologies driven from a passion to produce the most technically advanced, efficient and contemporary styled appliances. As pioneers of the world’s first drawer dishwasher – DishDrawer® – Fisher & Paykel continues to pave the way for appliance innovation. The kitchen has become the focal point of the home and a place to be enjoyed by all. The products inspire people to become chefs by delivering well-made appliances that focus on outstanding performance and incorporate user-focused innovations. Discover the superior quality and performance that makes Fire Magic the finest grill you can buy. Made in the USA for 80 years - and backed by the industry's best warranty. The Finest Outdoor Grills You Can Buy. For more than 80 years, Fire Magic has been building the world’s finest outdoor grills, for people who demand the highest quality and performance. 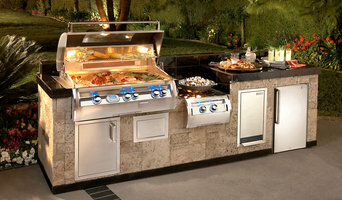 Our passion for manufacturing premium grills comes through in the pride of ownership that you’ll enjoy for a lifetime. Made from the highest quality materials, with the most advanced features for today’s discerning outdoor cook, and backed by the industry’s best warranty, Fire Magic is the last grill you’ll need to buy. And with an extensive line of premium accessories from refrigerators to side burners, Fire Magic makes it easy to create an extraordinary outdoor kitchen. Discover the grill you’ve been dreaming of. Fogazzo manufactures wood fired ovens, barbecues and fireplaces in easy to easy to install kits that can be finished using masonry, brick, tile of stucco, etc. Fogazzo is 100% Made in USA and uses only the highest quality US made materials. Lynx Grills is the premium brand for outdoor kitchen stainless steel products. 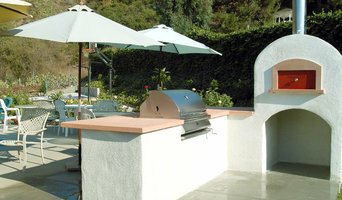 From grills to refrigerators to doors and drawers, since 1996, Lynx has been making quality outdoor kitchen products in sunny southern California. Gather friends and family to a kitchen that rewards with every meal. Sub-Zero, Wolf, and Cove are finely crafted appliances, engineered to keep food fresher longer, to cook predictably delicious dishes with precise control, and to provide spotlessly clean dishes. Built with premium materials, Sub-Zero refrigeration, Wolf cooking, and Cove dishwashing are designed and tested to perform for over 20 years of daily use. Reliable yet beautiful, they are made to the exacting standards of our Madison, WI family-owned and operated company – a company that’s always on call and ready to answer questions. Sub-Zero, Wolf, and Cove invite customers, owners, and designers to experience the sights, sounds, and tastes of their future kitchen in one of our unique showrooms. Showrooms are welcoming, creative spaces to get hands-on with the appliances, consult with product experts, and be inspired by the nearly endless possibilities of Sub-Zero, Wolf, and Cove. Visit subzero-wolf.com/showroom to request an appointment. About Cosmo Cosmo is a leading provider of affordable luxury kitchen products in the USA. We are a specialist in complete stainless steel kitchen product collections with superior components incorporating the latest technologies. Utilizing our own special understanding of your cooking needs, our products are designed to provide every kitchen with performance, style, and value. Our Vision We understand that with so many options on brands and models, it can be frustrating to choose which products will work best for your kitchen. For that reason, our goal is to provide consumers with a direct source to quality goods at manufacturer prices. Despite benchmark pricing, we aim to provide every consumer's kitchen with quality aesthetics and performance. At MD Appliances, we pride ourselves in outstanding customer service, in-depth knowledge of our products, and creating great relations with our clients. We realize how important specs are to our designers and contractors, and we go the extra mile to provide them with all the information they need. We cover the smallest of details and offer exceptional help and practical solutions to all our clientele. Our staff listens and pays close attention to the needs and desires of our costumers. We seek to offer the best fit, solutions, and options to meet their needs. With a combined experience of over 70 years, our sales staff has impeccable standards when it comes to servicing our designers, contractors, architects, and homeowners. Yes, you will even find the owner answering the phone and making home deliveries from time to time. We have helped thousands of customers complete their beautiful indoor and outdoor kitchens. Come in and see why once you purchase your appliances from MD Appliances, you will be a customer for life! We are a family owned business with 31 years of experience working with antique, vintage stoves and can offer you expert advice on all your stove related questions. In addition, our professional staff can restore your old stove into the stove of your dreams. Your stove can be shipped throughout the country and even internationally if you choose. We pride ourselves on maintaining a high standard of ethics and customer satisfaction is our primary goal. The Waadt family has been recommending, servicing and selling home appliances in the Los Angeles area for over 80 years. Established in 1930 by John Waadt Sr., Waadt Electric Company was located on Vermont Avenue and introduced thousands of Los Angeles families to modern home appliances. We have a long-standing reputation for friendly, knowledgeable customer service and invite you, your family and your friends to visit our appliance showroom. We are open 7 days a week! Your California appliance professional might handle any or all of the following jobs: selling, installing, repairing and upgrading both small and large appliances. He or she can advise you on the right equipment for your San Marino, CA home, from features to finishes, and is usually in the know about the latest technological advances and bells and whistles. When appliances hit a snag or start to show their age, a pro can advise you whether to repair or replace them, then carry out his or her recommendation. Some appliance professionals work closely with San Marino, CA builders, remodeling contractors, and kitchen and bath designers, among others. Here are some related professionals and vendors to complement the work of appliances: Kitchen & Bath Fixtures, Kitchen & Bath Designers, Kitchen & Bath Remodelers, Specialty Contractors, General Contractors. Find an appliance professional on Houzz. Narrow your search in the Professionals section of the website to San Marino, CA appliances. You can also look through San Marino, CA photos to find examples of rooms with appliances you like, then contact the professional who worked on them.